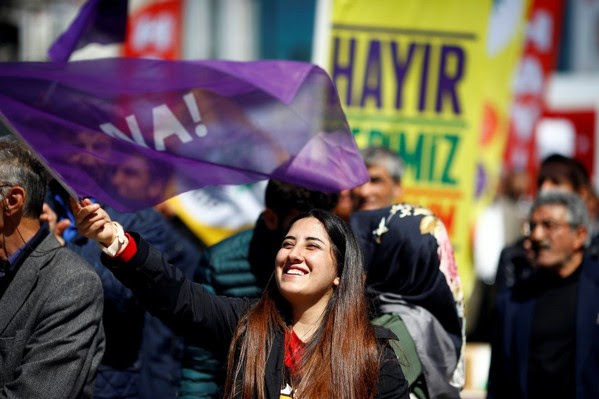 Learn more about Turkey’s constitutional vote taking place on Sunday that will shape this regional power’s future in this informative background guide. Leader Erdogan has been at the forefront of a global trend toward reactionary nationalism that has been seen in Great Britain (Brexit), the United States (election of Trump), France (rise of National Front party) and elsewhere. How the population chooses to move forward with its governance will be significant. There are many avenues to explore on this subject with your students: democracy and statehood, executive power, civil society, autocracy, religion and the state, and much more. Note: The following article was published in The Washington Post’s Today’s WorldView newsletter. This daily newsletter explores the intersection of global events with the Washington, D.C., political machine. Veteran journalist Ishaan Tharoor writes about foreign affairs for The Washington Post; he previously was a senior editor at TIME, based first in Hong Kong and later in New York. To receive this fantastic and very comprehensive daily brief, sign up here. A turbulent year in Turkish politics reaches its tipping point on Sunday. After surviving a coup attempt in July and leading a devastating purge of his country’s civil society and state institutions, President Recep Tayyip Erdogan now hopes voters will approve his plan to transform Turkey from a parliamentary democracy to a republic led by an immensely powerful president — which his opponents fear will be a de facto dictatorship. Turkish voters face two stark choices. They will either say yes to constitutional amendments that would give Erdogan sweeping new powers or no — an act of defiance that would nominally preserve Turkey’s battered democracy. Erdogan’s proposed system “has no parallel in the modern world,” wrote Henri Barkey, the director of the Middle East Program at the Woodrow Wilson International Center for Scholars. “It eviscerates the power of both the legislative and judicial branches of the government in favor of the executive, which will be concentrated in the hands of one person.” It would also create new presidential term limits allowing Erdogan to remain in office as late as 2029. If all goes to plan, Erdogan will have governed his nation for more than a quarter of a century when he finally steps down. Erdogan has made no secret of his desire to reshape the Turkish system. For decades, his supporters argue, Turkey’s dysfunctional parliamentary politics were an obstacle to successful governance and led to crises that triggered military coups. In the wake of last year’s failed coup attempt, they say there’s an even stronger need for a presidency that can withstand plots by unelected officials. “It became clear to us that a presidential system whereby the president is elected by popular vote forces groups to compromise with one another and nominate a candidate whom the public at large could support to win more than 50 percent of the vote,” wrote Ayse Sozen Usluer, a foreign policy adviser to Erdogan. Right now, there is only one figure who could possibly win that share of the vote: Erdogan himself. Many outside observers, including his most vocal critics in the West, see Erdogan first and foremost as an Islamist. This isn’t wrong, but it misses the point. Erdogan is a right-wing nationalist in the same vein as non-Muslim leaders like Russian President Vladimir Putin or Indian Prime Minister Narendra Modi. Erdogan’s public embrace of Islam and his steady erosion of the once ironclad secularism of the Turkish state reflect the attitudes of his political base: pious Sunni Muslims, whether from the Anatolian hinterlands or the poorer districts of the country’s major cities, who felt marginalized by Turkey’s secular elites. Erdogan’s Justice and Development Party, or AKP, is a modern center-right party. Its religious nationalism operates alongside laissez-faire attitudes toward business and economic reform. When Erdogan and the AKP came to power in 2002, they were hailed by many as a liberalizing breath of fresh air. Millions of Turks saw a dramatic and positive change in their fortunes — including Kurds, who were legally barred from even writing their own language in pre-AKP days. But as Erdogan settled into power, problems arose. A succession of political witch hunts and trials saw Erdogan and his inner circle locked in turf wars, first with the country’s secularist top brass and later with suspected Gulenists — followers of an exiled cleric and Erdogan opponent — in the country’s civil bureaucracy. His once-promising relations with the West deteriorated, killing Turkey’s dream of joining the European Union. Erdogan circled the wagons, declaiming various foreign and domestic conspiracies against his rule. After 2015 parliamentary elections went against him, Erdogan presided over the collapse of the peace process with the Kurds; a violent insurgency galvanized nationalist voters to his cause. 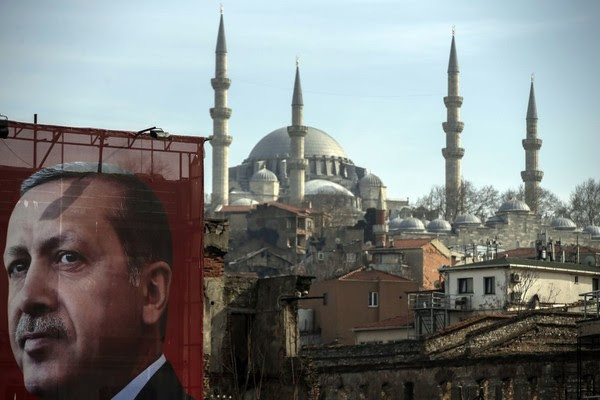 “Erdogan has also abandoned the ambitious foreign policy that boosted Turkey’s economy and helped increase the country’s role in international affairs, replacing it with a crude nationalism,” wrote Elmira Bayrasli, a professor at Bard College. Ties with Europe are at their nadir, and Erdogan’s much-maligned Syria policy is shaped mostly by domestic concerns. Critics say the ongoing purge, which has led to the detention of more than 100 journalists, is evidence of a would-be dictator shedding his democrat’s clothes. Which way will the vote go? Although opinion polls show the electorate almost evenly split, the contest has not been an equal or fair one. The full weight of the state has seemingly been thrown behind the “yes” camp, while opponents say they have faced 143 attacks over the course of the campaign. Turkey’s opposition is hampered by its own traditional fractures as well as the purges. The pro-Kurdish Peoples’ Democratic Party has been decimated, with its charismatic leftist leader, Selahattin Demirtas, now languishing in prison. As with other recent Turkish elections, the outcome may depend on a couple of key swing blocs: religious Kurds who like the AKP but are wary of Erdogan’s style and irked by his crackdown on their compatriots, and hard-line ultra-nationalists who despise groups like the Kurds but are not convinced by the AKP. Critics fear that the referendum poses a “lose-lose” situation for Turkey: a choice between prolonged instability or institutionalized one-man rule. Even then, the future still looks messy. Erdogan will never command full support. The tighter his grip gets, the more desperate the backlash may become — and Cagaptay warns of potential of violence and civil conflict.